I get a lot of questions from first time clients on what they need to do for their appointment. I started thinking that it would be a good thing to talk about on here, since sometimes we all need a little refresher on things. Arrive early. Your appointment starts at the time that we give you. Which means that, ideally, we'd like to have you in the chair starting at that time. Try to arrive 10-15 minutes early. That way you can get checked it, have something to drink, relax a bit. Call ahead if you're worried the stylist might be running behind. Things happen. Services take long than expected. So if you need to be out at a certain time and are worried about making it, just call ahead and see if the stylist is on time. The front desk can help you make a decision on what to do. Then tell your stylist again when you get into the chair. "Hey Betty, I've got to be back at work at 2. What can we do to make that happen?" Bring inspiration with you. I work with my stylist everyday. We talk about what I want to do with my hair the week leading up to my appointment, but I still bring photos on the day of my appointment, and we go over it again. For the most part, hair stylists are very visual, so pictures always help. 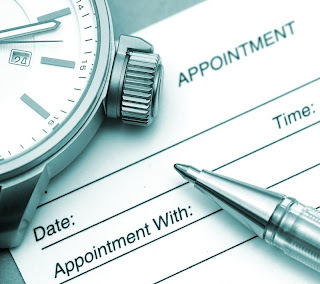 What are your tips to making your appointment run more smoothly? Tell me in the comments below!